We would like to introduce ourselves as leading suppliers of TERRY TOWELS with customization of your logo branding. There is increasing demand of EMBOSSED TOWELS to promote brands especially in pharma, jewelry, electronics shops including malls. 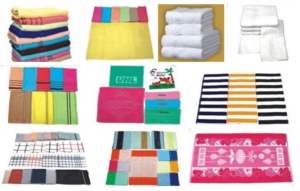 Please do let us know your interest and requirements in Corporate gift towels, promotional towel sets, uni dyed bath & crape bath towels, jacquard kitchen & bath towels, hotel towels, pool towels with either your logo embossed or embroidery. We have attached some other logo towels just for your idea. We have also included some items with Poly cotton yarn which are cheaper than 100% Cotton products. 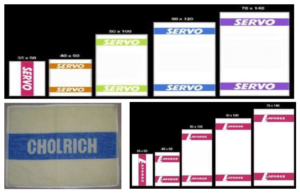 Promotional towels with logo shown below in three choices of patterns in different sizes to help you select the best options for your promotional needs. Please note we can supply towel with your required logo, in required size and weight depending on your budget. The below range is also available in 80% cotton and 20% poly cotton. The 360 or 400 grams 100% cotton towel weighing each either 63 or 70 grams in 35x 50 centimetre size with MOQ of 7,000 numbers. The 360 or 400 grams 100% cotton towel weighing each either 86 or 96 grams in 40x 60 centimetre size with MOQ of 5,000 numbers. The 360 or 400 grams 100% cotton towel weighing each either 180 or 200 grams in 50×100 centimetre size with MOQ of 2,500 numbers. 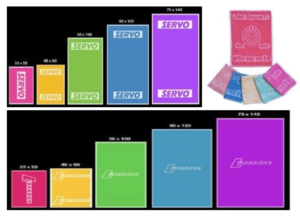 The 360 or 400 grams 100% cotton towel weighing each either 259 or 288 grams in 60×120 centimetre size with MOQ of 1,600 numbers. 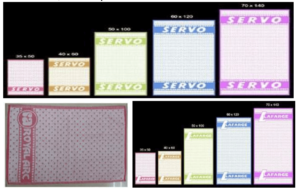 The 360 or 400 grams 100% cotton towel weighing each either 353 or 392 grams in 70×140 centimetre size with MOQ of 1,200 numbers. If require we can supply same item in 100% cotton quality too as per image shown below. Towels gift sets in 400 gsm with strong weave to make them highly durable and absorbent readily available in multi-color in 100% cottons. Face towels gift pack available as set of seven face towels for every day of the week as per the image shown below with seven different colors and day of the week mentioned on each face towel. In next image dobby style and yarn-dyed pattern beach bath towels is also an option. Bath towels designed to be soft and comfortable against your skin. If you would like to pamper your target audience then go for ultra-soft, oversized finest hotel collection towels to help your recipient wrap themselves in the unique luxury for greater experience. Towel gift set containing full range of face, hand and bath towels to impress the recipients. We have many exclusive items which can also be given as gift with special packing to achieve your end objective. We are also attaching images of some of them for your ready reference and will do any type of special packaging to ensure maximum mileage out of your promotional activities. 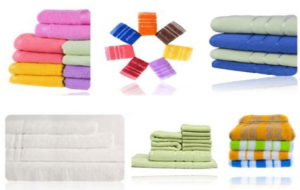 Please also feel free to contact us for the option of branded Bombay Dyeing towel sets.